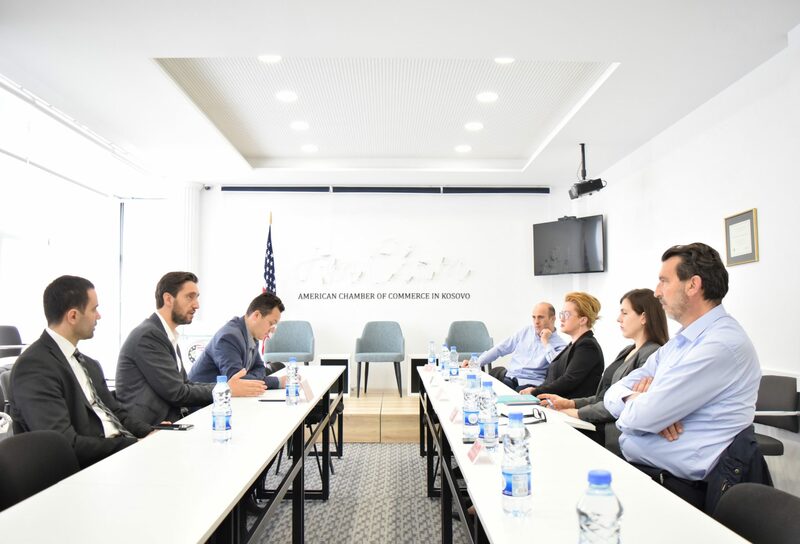 Prishtina, April 3, 2019 – During the meeting organized by the American Chamber of Commerce in Kosovo with the Minister of Health, Uran Ismaili, and members of AmCham Healthcare Committee was discussed about the creation of a health insurance system, its importance in the country, as well as the need for higher inclusion of businesses in the drafting process of policies in this sector. Minister of Health, Uran Ismaili, considered the continuation of genuine communication between the public and private sectors in the drafting process of policies in the health sector which are of prior importance in ensuring the implementation of these policies in the country. Minister Ismaili mentioned that the lack of the health insurance system has resulted in high costs for citizens and also in difficulties for public institutions’ operations. In this regard, he said that the Ministry he leads has advanced in the drafting stages of the law on health insurance which will regulate this issue in a fair manner. Chairperson of AmCham Healthcare Committee, Armend Agani, said that Kosovo needs continuous training and education for healthcare practitioners in order to provide the most qualitative services for citizens. Again thanked Minister Ismaili for his commitment in regulating the health sector, while requiring a higher inclusion of the private sector in working groups in drafting the legislation which highly affects their operations. Further on, members of AmCham Healthcare Committee mentioned the need for the full implementation of current laws provisions as well the furtherance of cooperation in issues that affect this sector in the country.